A not-so-sweet cake is pushing the little cakes around—never saying "please," "thank you," or "sorry." It takes what it wants without asking and is never wrong. But what happens if a giant cyclops comes around? 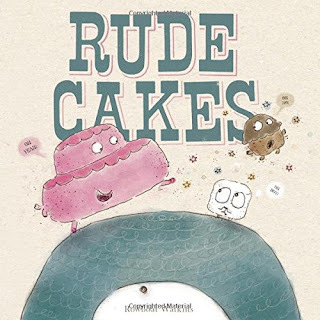 Will the little rude cake get its just desserts? Even the rudest cake can learn to change its ways. Yes, I said giant cyclops. Because why not. And why wouldn't multi-tiered, fully iced cakes play on the playground and take baths. ...Okay I'm being a little sardonic. It came off really random and strange to me, but that may be humorous for others, like children (it is a pretty childish sort of humor). The illustrations are cute, and I do appreciate the little asides and speech bubbles adding to the story. But man, it's kind of weird. Also, that little cake is really mean. And its parents (parents? I think so...) are pretty idiotic (look for the dad on the monkey bars). So I don't fully appreciate that the way this rude cake learned its lesson was through the threat of giant cyclops. Not through its (completely inept) parents. I did like the cyclops' manners—which provided a nice lesson—but, yeah. I don't think I'd ever use it in storytime and won't be in a huge rush to recommend it. Unless I find that children are loving it. Hard to say.